E-Sperse® epoxy additives greatly increase the stability of waterborne epoxy resin emulsions due to the similarity of the surfactant hydrophobe and the epoxy chemical structure which provides stable anchoring of the surfactant to the dispersed epoxy micelle surface. The particle stability is similar to systems utilizing a reactive surfactant, but when drawn down into a coating, the E-Sperse® surfactant will dissolve into the bulk of the curing resin. The risk of surfactant-rich domains forming in the coating is minimized, thus improving water resistance. E-Sperse® epoxy additives provide long pot life and short cure times to waterborne epoxy emulsions. E-Sperse® surfactants are also miscible in the epoxy resin and act as compatibilizers between hardeners and epoxy resins. Problems with corrosion? Not after the addition of EthoFlex™ ER. EthoFlex® ER is a multi-functional additive for epoxy coatings. This single additive simultaneously improves several coating properties, such as toughness, impact resistance, corrosion resistance, gloss, weathering resistance, and adhesion without impeding pot life and cure time or increasing VOCs. EthoFlex® ER exceeds the performance of most other single-property additives in their designed use. Usage rate is 5-30% depending on the quality of the starting epoxy resin and hardener. EthoFlex® ER may be added to the epoxy or hardener and functions well with most solvents. Use of ERS 480 in solvent-borne epoxies results in higher elongation in the coatings, as well as improved impact resistance. Impact resistance is another area where products treated with EthoFlex™ ER show a marked performance boost. On top shows our control with no EthoFlex™ ER. 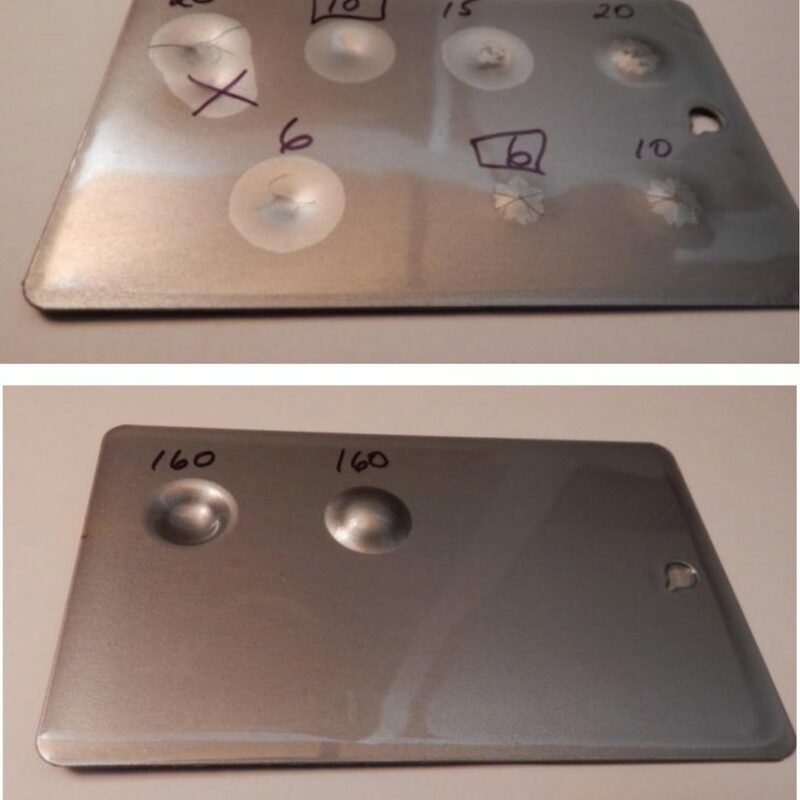 Bottom image shows 30% EthoFlex™ ER. However, depending on the amount used and the ethoxylate chain length, it may have a detrimental effect on corrosion protection. E-Sperse® 704 is an excellent choice to create long-term stable epoxy dispersions without extending cure time. E-Sperse® 704 is VOC- and APE-free and allows for a high solids system with low viscosity, as well as improved gloss and water resistance. Since no reactive epoxy groups are added, recalculation of the EEW is not needed. E-Sperse® 703 can be added to E-Sperse® 704 to produce epoxy dispersions that are freeze/thaw stable. The epoxy dispersion also maintains low viscosity during long-term shelf and heat age stability studies. E-Sperse® 703 improves compatibility between the epoxy and hardener. 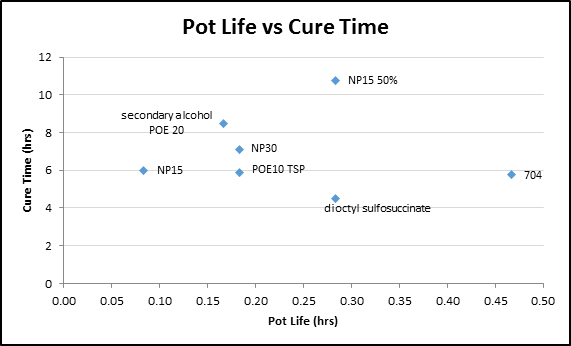 E-Sperse® 703 extends pot life without impacting cure time. A 75% by weight epoxy dispersion is produced by adding liquid epoxy, water, and 1 - 5% E-Sperse® 704 into a suitable container. Blends of E-Sperse® 704 and E-Sperse® 703 may also be employed. This mixture is then sheared for about 3 minutes to produce the dispersion. Heating of the epoxy mixture is required to disperse epoxies that are solid at room temperature. E-Sperse® 704 and E-Sperse® 703 extend the pot life of 2K epoxy dispersion systems. The addition of E-Sperse® 704 to amine hardeners improves the stability of the mixed epoxy and hardener, allowing for better uniformity of the coating. Often adduct formation may be avoided altogether. Pot life of the system is increased, while only slightly affecting cure time. The applicator gains increased working time and less wasted material, while not sacrificing productivity due to slow curing. Additionally, use of E-Sperse® 704 and E-Sperse® 703 affords significant improvements in corrosion and blister resistance. Recommended dosage is between 10% and 50% of the hardener, based on solids. Blend E-Sperse® 704 into the existing hardener package. Studies show that when E-Sperse® 704 is added to an aliphatic amine hardener and an epoxy dispersion (produced with 5% E-Sperse® 704), the pot life increased by 100%. Each formula would require optimization, dependent on the end use needs.